Report shows Gulf States seriously hiking arms purchases from US since 2011 Arab Spring. Saudis were world's 2nd largest importer. A new report by the Stockholm International Peace Research Institute (SIPRI) has revealed that Gulf States have skyrocketed their weapons imports in the last four years since the 2011 "Arab Spring," spiking the imports by over 200%. The report, published on Monday, indicates that Saudi Arabia and Qatar significantly boosted their weapon imports from the US. Part of that increase would seem to come as part of the fallout over the US-brokered controversial Iran nuclear deal, which the Sunni Gulf States view as a serious threat from their Shi'ite rival, and which Israel reports has set off a nuclear arms race. Saudi Arabia was revealed by the report to be the world's second-largest arms importer between the years of 2011 and 2015, as its imports shot up by 275% as compared to 2006-2010. Similarly Qatar increased its imports by 279% in the same period, and the United Arab Emirates (UAE) raised its own weapon imports by 35%. 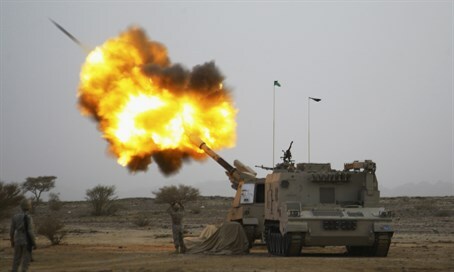 The report comes after a ten-nation Saudi-led coalition was recently launched to fight Iran-backed Houthi rebels in Yemen. The campaign reportedly costs the oil-rich Saudis $200 million a day, or $6 billion per month. "A coalition of Arab states is putting mainly US and European-sourced advanced arms into use in Yemen," Pieter Wezeman, Senior Researcher of the SIPRI Arms and Military Expenditure Program, was quoted as saying in the report. "Despite low oil prices, large deliveries of arms to the Middle East are scheduled to continue as part of contracts signed in the past five years." The report looked at data from "all international transfers of major conventional weapons, including sales, gifts and production licences to states, international organizations and armed groups."